Get the ''Edge'' you need with the latest advancements in pre-workout nutrition and supplementation. Some days, you hit your workout feeling energized and powerful. You finish knowing you gave it your all, leaving nothing on the table. Other days, you struggle immensely. You work as hard as you can, but you're exhausted. You try to shake the fatigue and grogginess, but it feels like you're just going through the motions and there's nothing you can do to change how your body is responding. You desperately need some kind of edge to fight this struggle. Why does this happen? Maybe you've researched some of the reasons why, but you still haven't figured out how to combat that fatigue—until now. No matter what type of training you're passionate about, there are key nutritional strategies and supplements available to give your body its best chance to work out at the highest level possible. This two-part road map, broken down into Stage 1 and Stage 2, is your plan for exactly what to do and how to do it. Stage 1 is an optimally composed pre-workout solid meal, eaten 2-3 hours before you train. Stage 2 follows up with a liquid source of nutrients and performance-enhancing ingredients, consumed 60 minutes or less before exercise. Take these two steps and you'll go into your workout with the energy, motivation and intensity you need. The proper pre-workout nutrition puts your body in an optimal state to build and protect muscle, ensures you are optimally hydrated and your blood sugar remains steady, keeps cortisol and insulin in proper balance to reduce the storage of fat, assists in mental recovery, and maintains your immune system. Do you want to gain an edge in your fitness and nutrition knowledge so you can consistently perform at your best? Here's your plan! Eat your pre-workout meal 2-3 hours before you train, along with drinking 14-22 ounces of water. This allows enough time for your body to digest and absorb the nutrients, and the glucose and insulin in your blood to go back to baseline before your workout. You don't want to go into your workout with elevated insulin, as insulin directly reduces your body's ability to burn fat. How much protein and how many carbohydrates you should take in will vary based on how long you train, what type of training you do, your fitness level, and your current diet. Your pre-workout meal should be light and comprised of protein and carbohydrates. How much protein and how many carbohydrates you should take in will vary based on how long you train, what type of training you do, your fitness level, and your current diet, so keep in mind that these numbers are not set in stone and you should experiment to find what works best for you. You also need to be properly hydrated, which is the reason for the recommendation of 14-22 ounces of water with your meal. If your body is not in optimal fluid balance prior to exercise, expect to experience a big drop in performance and loss of energy, as repeatedly proven in sports-nutrition research. Staying optimally hydrated is a simple step, but it's an essential piece of the performance puzzle that's all too often overlooked. Take your weight in pounds and divide it by 2.2 to get your weight in kilograms. To calculate your protein requirements, multiply your weight in kilograms by .15 grams for your low end of the range and by .25 grams for your high end of the range. To calculate your carbohydrate requirements, multiply your weight in kilograms by .25 grams for the low end of the range and by 1 gram for the high end of your range. For example, a 180-pound individual weighs 81 kilograms. They would take in 12-20 grams of protein and 20-80 grams of carbs during their pre-workout meal. Avoid fat as much as possible in this pre-workout meal. Research suggests fat may bring about a calming effect with less cognitive arousal in subjects 2-3 hours after ingestion—another reason why the composition of your pre-workout meal is so crucial. Choose lean, low-fat sources of protein that are high in tyrosine and other amino acids that promote stimulant neurotransmitters under physically stressful conditions. These neurotransmitters, such as adrenaline and dopamine, help you feel energized, alert, and motivated to get your workout started. Your pre-workout meal should be light and comprised of protein and carbohydrates. Don't rely on the terms "complex carbohydrate" versus "simple carbohydrate." There are many so-called complex carbohydrates, such as maltodextrin, that are actually rapidly absorbed and cause a quick insulin release similar to a simple sugar. Choose slow-digesting carbohydrate sources that are not high in fiber. While fiber is highly beneficial at other times during the day, taking in large amounts pre-workout is not optimal and can lead to gastrointestinal upset. Aim to take in carbohydrate sources that are high in amylose (slow-digesting starch) and low in amylopectine (fast-digesting starch). There are significant differences in the carbohydrate makeup of food sources, even between foods that seem similar. For example, a standard white potato provides 20 percent amylose, while a red sweet potato has 32 percent or more of amylose—a big difference. In this stage, you're giving your body one powerful extra round of nutrients and fatigue-fighting ingredients to provide energy and focus, bring the maximum amount of blood flow to your muscles for optimal nutrient delivery, and prime your body for recovery. There are two paths you can take—Path A and Path B—depending on your prior muscle and liver glycogen status, the type of training you do, and how long your training session is. Try each path, regardless of which set of parameters you may fit into, and find out which works best for you. By now, you know there's always variability among individuals, so recommendations aren't a one-size-fits-all. You weight lift/resistance train for 90 minutes or less at a time. You're on a low-carbohydrate, high-protein diet in which your liver and muscle glycogen stores are low. You train first thing in the morning in a fasted state. You are sensitive to reactive hypoglycemia, where you feel lightheaded, dizzy and lethargic after ingesting a fast-absorbing carbohydrate. Move up your ingestion to within 10 minutes or less pre-workout. Take 7-10 grams of essential amino acids high in the branched-chain amino acids (BCAAs), with the ergogenic ingredient supplement concoction outlined further down in this article, mixed into 8-16 ounces of water 60 minutes or less before your workouts. 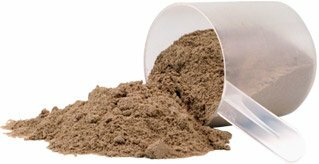 Tip: You do not want to ingest a slow-digesting intact protein (any typical protein powder) at this point, as that takes time to digest and is filled with nonessential amino acids. Make sure to get a full spectrum of all essential amino acids, not just the branched-chain amino acids. Don't be confused by the percent of the protein hydrolysates versus the percent of actual dipeptide and tripeptide content. For example, some protein hydrolysates state 90-100 percent hydrolyzed. This does not tell us what percentage of it is comprised of the beneficial rapidly absorbed dipeptides and tripeptides, which are what you're looking for. At this time, research does not support the idea that individuals who ingest carbs during this time frame and partake in resistance/weight training will see a significant change in endurance. But we know research and real-world results don't always line up perfectly, so experiment with the 5-10-gram range, as well as going completely without carbs, and see how your energy and endurance are affected. This path includes a fast-digesting carbohydrate in addition to your peptide/amino acid/ergogenic concoction outlined in Path A. Take an additional 10-15 grams of a fast-digesting carbohydrate 30 minutes prior to your workout, mixed in with your pre-workout amino acid and ergogenic concoction. Examples of fast-digesting carbohydrates include dextrose, maltodextrin, and waxy-maize starch. Some of these carbohydrates may be included in your pre-workout product. If they aren't, there are carbohydrate powders at your local supermarket, including Gatorade and others, that contain dextrose and/or maltodextrin. Here's an example of an optimal ergogenic ingredient concoction to be mixed in with your personalized amino-acid and carbohydrates concoction from above and taken 60 minutes or less prior to training. Experiment with the timing of this cocktail; you'll find that 20-30 minutes prior to training is optimal. This mixture of the amino acid citrulline and malic acid can help increase your performance in high-intensity exercise, as well as longer endurance-training protocols. Other key benefits include increased nitric oxide (NO) and blood-flow enhancement. The most recent research shows it can even decrease muscle soreness by 40 percent at 24 hours and 48 hours following exercise. Optimal pre-workout dosing: 3-4 grams. Most of the research shows 6-8 grams per day is optimal, split into two doses. Timing your 3-4 grams pre-workout means the citrulline and malic acid will be circulating in your body, fighting off fatigue-causing ammonia buildup and allowing you to push harder for longer. Taking higher doses pre-workout brings about stomach upset, so do your best to stick in the 3-4-gram range for your pre-workout dose instead of taking 6-8 grams all at once and having to run to the bathroom. This supplement supports neurological and immune-system recovery post-exercise, largely through helping control and reduce cortisol levels—important areas that are often overlooked in exercise performance and recovery. In addition, it's shown in research to support the body against stress and anxiety. Research shows diminished levels of the neurotransmitter acetylcholine could be a contributing factor in muscle fatigue and poor workout performance. Acetyl-L-carnitine and choline provide the two major building blocks to insure optimal levels of acetylcholine in our bodies. Beta-alanine is the second most research-backed ingredient in sports nutrition, following creatine. It's been repeatedly shown to delay muscular fatigue by boosting a natural buffer inside our muscles, called carnosine. Carnosine absorbs hydrogen ions (H+) that are produced during high-intensity exercise. It is the increased levels of H+ that cause the drop in our muscle pH (becoming more acidic) during exercise. The drop in pH directly interferes with our muscles' ability to contract. Boosting muscle carnosine concentrations with beta-alanine fights against that pH-related performance drop, increasing muscular endurance. Creatine is the most effective and research-backed ingredient in sports nutrition to increase strength, power and lean body mass. Trimethylglycine contains a methyl component that our bodies use to synthesize a substance called SAM-e. SAM-e is used to make both adrenaline and dopamine to support and maximize mental and physical stimulation, bringing about increased force and power production. Additionally, TMG is shown to protect cells from dehydration by increasing water retention. It's an ingredient that has strength and power benefits, along with powerful endurance and hydration benefits. Caffeine works well as a pre-workout energy stimulant to help blunt exercise-related pain. To get the most out of your caffeinated pre-workout, avoid consuming caffeine at other times throughout the day, and do your best to skip caffeine on nontraining days. This will help you stay sensitive to the energy stimulation from your pre-workout caffeine, giving you the largest energy kick when you need it most. How do you live at the Edge? You're on a mission. You know it's going to take hard work to reach your goals, and you know the best things in life never come easy. You have to earn it—there aren't any miracle pills or shortcuts—but there are strategies and tools that can have a big, positive impact on your progress and performance. We are on this mission with you, fully committed and dedicated to sharing the knowledge, strategies, and tools that will give you the edge you need to fight against your challenges, train with passion and achieve your fitness goals. If you follow both the timing and the nutrient composition of these research-backed suggestions, you'll greatly reduce—and often eliminate—the daily battle you fight against low energy and mental fatigue. Smith, A., Leekam, S., Ralph, A., & McNeill, G. (1988). The influence of meal composition on post-lunch changes in performance efficiency and mood. Appetite, 10(3), 195-203. Paz, A., & Berry, E. M. (1997). Effect of meal composition on alertness and performance of hospital night-shift workers. Annals of Nutrition and Metabolism, 41(5), 291-298. Leigh Gibson, E., & Green, M. W. (2002). Nutritional influences on cognitive function: mechanisms of susceptibility. Nutrition Research Reviews, 15(01), 169-206. Love, H. L., Watters, C. A., & Chang, W. C. (2005). Meal composition and shift work performance. Canadian Journal of Dietetic Practice and Research, 66(1), 38-40. Young, A. H. (2004). Cortisol in mood disorders. Stress: The International Journal on the Biology of Stress, 7(4), 205-208. Bendahan, D., Mattei, J. P., Ghattas, B., Confort-Gouny, S., Le Guern, M. E., & Cozzone, P. J. (2002). Citrulline/malate promotes aerobic energy production in human exercising muscle. British Journal of Sports Medicine, 36(4), 282-289. Malaguarnera, M., Vacante, M., Motta, M., Giordano, M., Malaguarnera, G., Bella, R., ... & Pennisi, G. (2011). Acetyl-L-carnitine improves cognitive functions in severe hepatic encephalopathy: a randomized and controlled clinical trial. Metabolic Brain Disease, 26(4), 281-289. Malaguarnera, M., Cammalleri, L., Gargante, M. P., Vacante, M., Colonna, V., & Motta, M. (2007). L-Carnitine treatment reduces severity of physical and mental fatigue and increases cognitive functions in centenarians: a randomized and controlled clinical trial. The American Journal of Clinical Nutrition, 86(6), 1738-1744. Auddy, B., Hazra, P. J., & Mitra, P. A. (2008). A standardized Withania somnifera extract significantly reduces stress-related parameters in chronically stressed humans: a double-blind, randomized, placebo-controlled study. Sandhu, J. S., Shah, B., Shenoy, S., Chauhan, S., Lavekar, G. S., & Padhi, M. M. (2010). Effects of Withania somnifera (Ashwagandha) and Terminalia arjuna (Arjuna) on physical performance and cardiorespiratory endurance in healthy young adults. International Journal of Ayurveda Research, 1(3), 144. Raut, A. A., Rege, N. N., Tadvi, F. M., Solanki, P. V., Kene, K. R., Shirolkar, S. G., ... & Vaidya, A. B. (2012). Exploratory study to evaluate tolerability, safety, and activity of Ashwagandha (Withania Somnifera) in healthy volunteers. Journal of Ayurveda and Integrative Medicine, 3(3), 111. Smith-Ryan, A., & Antonio, J. (2013). Sports Nutrition & Performance Enhancing Supplements. Linus Learning. Hoffman, J. R., Ratamess, N. A., Kang, J., Rashti, S. L., & Faigenbaum, A. D. (2009). Effect of betaine supplementation on power performance and fatigue. Journal of the International Society of Sports Nutrition, 6(1), 1-10. Lee, E. C., Maresh, C. M., Kraemer, W. J., Yamamoto, L. M., Hatfield, D. L., Bailey, B. L., ... & Craig, S. A. (2010). Ergogenic effects of betaine supplementation on strength and power performance. Journal of the International Society of Sports Nutrition, 7, 27. Cholewa, J. M., Wyszczelska-Rokiel, M., Glowacki, R., Jakubowski, H., Matthews, T., Wood, R., ... & Paolone, V. (2013). Effects of betaine on body composition, performance, and homocysteine thiolactone. Journal of the International Society of Sports Nutrition, 10(1), 39. Conlay, L. A., Wurtman, R. J., Blusztajn, K., Coviella, I. L., Maher, T. J., & Evoniuk, G. E. (1986). Decreased plasma choline concentrations in marathon runners. The New England Journal of Medicine, 315(14), 892. Buchman, A. L., Jenden, D., & Roch, M. (1999). Plasma free, phospholipid-bound and urinary free choline all decrease during a marathon run and may be associated with impaired performance. Journal of the American College of Nutrition, 18(6), 598-601. Ormsbee, M. J., Bach, C. W., & Baur, D. A. (2014). Pre-exercise nutrition: the role of macronutrients, modified starches and supplements on metabolism and endurance performance. Nutrients, 6(5), 1782-1808. Kerksick, C., Harvey, T., Stout, J., Campbell, B., Wilborn, C., Kreider, R., ... & Antonio12, J. (2008). International Society of Sports Nutrition position stand: Nutrient timing. Journal of the International Society of Sports Nutrition, 5, 17. Sebastian Balcombe is the founder and CEO of Athletic Edge.